The working principle of ELCB is based on core balance or differential current protection. When there is no leakage or fault in the system, the current passes through phase and neutral is same. When there is fault, the current flows through load to earth. The phase and neutral conductor passes through core and net flux becomes zero under balance condition. If there is an earth fault, the induced emf in the secondary due to difference in the flux or current between incoming path and outgoing path. The terminal of secondary winding is connected to relay which open main contact due to tripping mechanism. 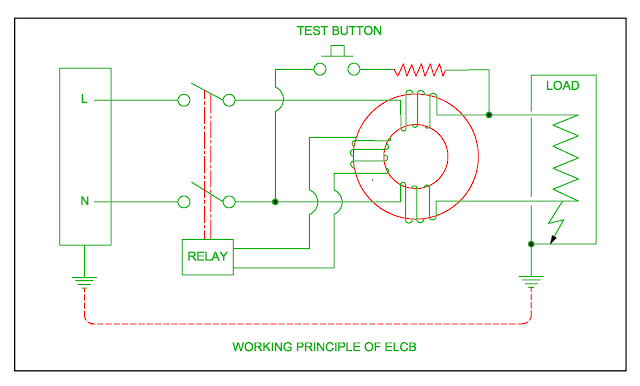 The wiring of single phase / three phase ELCB is done such that all phase and neutral connection done in the ELCB otherwise due to switching of load, the circuit breaker trip. The circuit breaker of neutral conductor of the load side is not connected to earth. If it is connected to earth, the ELCB trips continuous. If the ELCB shows continuous trip, there should be fault in neutral circuit. The current setting of the ELCB is done up to maximum 30 mA because any person’s body does not withstand more than 30 mA leakage current. There should be no guarantee for person’s life if current passes through body more than 30mA. This type of ELCB is current operated therefore it is called as residual circuit breaker ( RCB ).